February 5, 6, 7, 8 & 9, 1985. 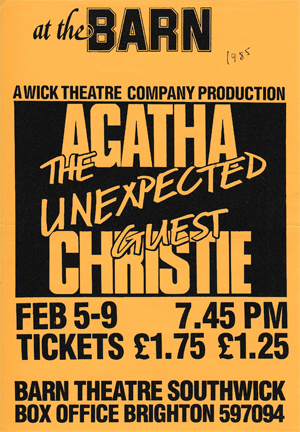 RB wrote: “It is some time since Wick presented an Agatha Christie play and it has been a pleasure to direct The Unexpected Guest, doubly so as this is my first as a Director for the Company. Agatha Christie’s characters are always very ‘real’ people and even the eccentric Richard Warwick, whose personality affects the whole atmosphere of this play, is no exception. Richard may well have been based on Agatha Christie’s brother, Monty. He had been a big game hunter, was wounded, and on his return to England is described, by her, as ‘one of the most difficult people in the world to live with’. The incident, related by Laura in Scene 1 of Richard taking pot shots at a caller, actually occurred frequently with Monty. He even ‘sent shots all round’ Madge [his sister] and she was frankly terrified. ‘I can’t think why!’ said Monty. ‘I shouldn’t have hurt her. Does she think I can’t aim?’ .. to quote Agatha Christie’s autobiography. I hope you will enjoy the play as you join our Inspector and his Sergeant unravel the plot. Can you be absolutely certain, even by the end of the play, who did do it? AN unexpected guest will be turning up at the Barn Theatre, Southwick next week – five nights running. For then the Wick Theatre Company will be staging their production of Agatha Christie’s thriller entitled The Unexpected Guest. The play is set during a winter night and the cast of nine were certainly able to get into the mood for the play as they trudged to rehearsal in the snow and ice. In the leading rôle of the guest will be Mervyn Gerrish while the leading lady is to be played by Rosemary Mose. This is the first play to be directed by Rosemary Biggs, who during many years with the company has acted, helped front of house and back stage. Taking on the job of director led Rosemary to read Agatha Christie’s autobiography as back-ground research. During the reading Rosemary started to draw conclusions between the characters in the play and the people who the playwright had known. Rosemary believes the character of Richard Warwick in The Unexpected Guest was based on the authoress’ own brother Monty. “There are incidents involving Monty in the biography which Richard describes as doing in the play”, explained Rosemary. The play opens at the Barn on Tuesday [February 5] and runs until Saturday, performances start at 7.45 p.m.
FROM A deceptively simple crime that mistress of the ‘whodunnit’ Agatha Christie weaves her customary web of intrigue and suspense in The Unexpected Guest. She has undoubtedly penned many more gripping mysteries, but Wick Theatre Company’s version under the direction of Rosemary Biggs did ample justice to the writer’s craft. Although slightly rough at the edges and by no means word perfect, last Friday’s performance at the Barn Theatre, Southwick, evoked a strong enough atmosphere to keep the audience hooked. A lot of credit must go to newcomer Mervyn Gerrish, whose stage presence and superb voice projection helped carry the production. His portrayal of Michael Starkwedder – the ‘unexplained guest’ – made sure no one lost interest as to who had shot eccentric, ex-game hunter Richard Warwick. Inevitably, suspicion fell on all the characters and there to solve the crime were the well-heeled Inspector [Ralph Dawes] and his poetic side-kick Sergeant Cadwaller [David Davison]. Despite the need to be prompted occasionally, Ralph Dawes was his usual accomplished self and Dave Davison successfully lightened the load with his flair for the comic in the charming cameo rôle. Of the two Wick debutants, Edwina Fletcher [Mrs. Warwick] took the honours from a rather stilted Nigel Collard [Henry Angell] and there was an interesting performance from Martin Cramp. Whether intentional or not, he could almost have been to the David Bowie ‘school of acting’ the mannered way he played the mentally disturbed Jan Warwick. Another success story was Rosemary Mose as the victim’s widow, Laura Warwick, and the cast was competently rounded off by Sheila Wright [Miss Bennett], Michael Donkin [Julian Farrar] and James Biggs [Richard Warwick]. The prompts flew thick and fast in the first half of this lack-lustre Wick Theatre Company production of the Agatha Christie murder mystery. The acting was listless and wooden, writes Mike Howard. The only attraction was the detailed and authentic-looking set designed by Sandra Peaty and Ralph Dawes. This kind of production gives amateur dramatics a bad name. The second half may have been marvellous. I don’t know. I confess I left at the interval.